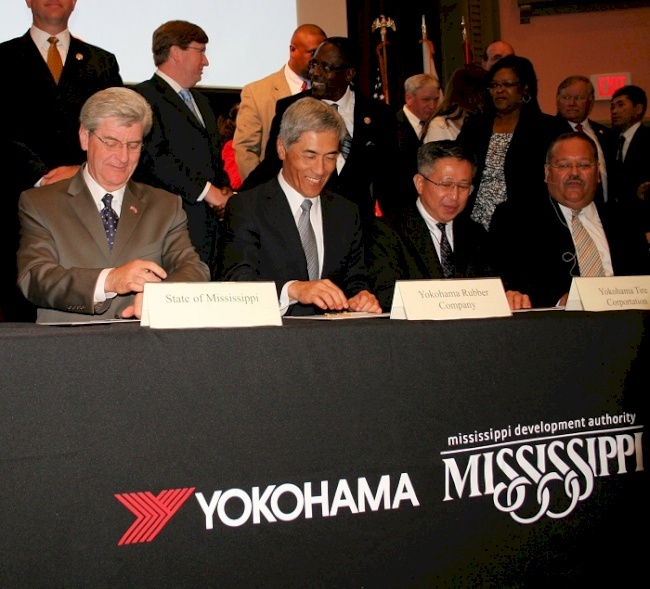 FULLERTON, CA (April 29, 2013) – Yokohama Tire Corporation (YTC) today signed an agreement to build a commercial truck tire plant in West Point, Mississippi. The facility, which is expected to produce one million tires starting in 2015, will have an initial capital investment of $300 million and potential plant expansions could reach up to four times the original employment and investment levels. Noji, along with Gov. Bryant and officials from the state, participated in today’s signing ceremony at the West Point Ritz near the site of the future company plant, about 149 miles from Jackson, MS, the state capitol. “West Point and Mississippi offer the optimal mix of cost and operating conditions advantages that Yokohama is seeking to achieve,” said Darin Buelow, principal, Deloitte Consulting LLP and leader of Deloitte’s Real Estate & Location Strategy practice. The plant will be built on over 500 acres of land with construction expected to begin in September and completion two years later. Yokohama expects to hire approximately 500 employees to work at the facility.